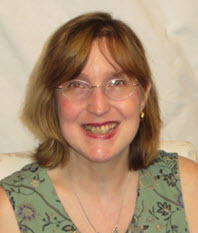 Viva Vivien! For her would-be 100th birthday, the late star receives love and admiration. 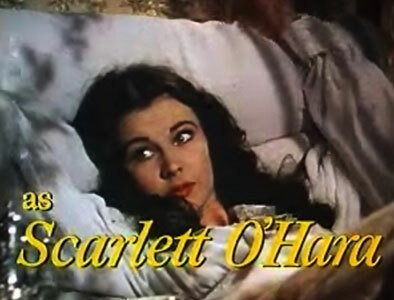 Her beliefs were challenged when she gained “overnight stardom” as the willful and determined Southern belle, Scarlett O’Hara. 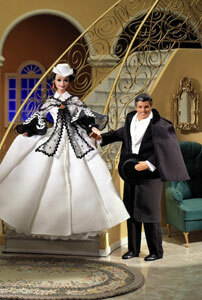 Barbie and Ken visit the Civil War Era in their guises as Scarlett and Rhett. 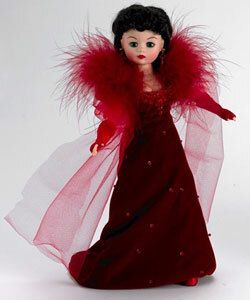 The huge number of costume changes made Vivien as Scarlett a natural choice for a Franklin Mint fashion doll. 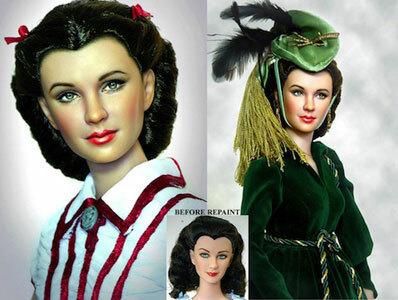 Decked out in green, Scarlett O’Hara shows off her Irish heritage in this Alexander treatment. 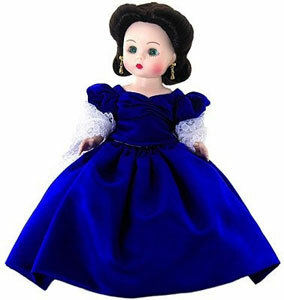 Looking lovely in a rich blue hue, Scarlett steals the show in her Alexander re-creation of the film’s wardrobe. Noel Cruz brings his magic to Vivien’s embodiment of Scarlett O’Hara. The results are stunning. … to moments of sorrow and regret. 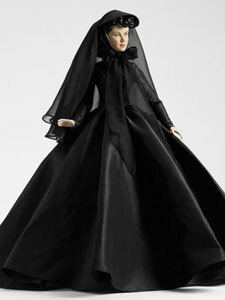 Here Scarlett is attired in her mourning clothes, courtesy of Robert Tonner. 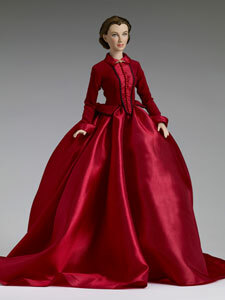 Scarlett lives up to her namesake in this ruby red gown from the Tonner Doll Company. 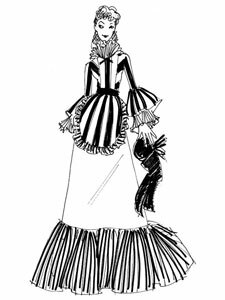 Soon to arrive from Robert Tonner is the “Peachtree Street Stroll” ensemble, shown here in sketch form. Scarlett matures and strengthens against the backdrop of a costume-historical epic film. World Dolls showed her many moods in her many outfits. 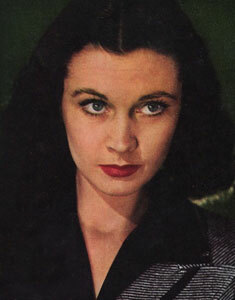 Vivien Leigh never wanted to be a movie star. Time and again, she was quoted as saying that movie stars were “fake” and their focus was “all wrong.” She boldly stated that she wanted to be remembered for her work, not for her good looks or her charm or her marriages or love affairs. Poor Vivien—she didn’t get her wish. She was a movie star—though she made less than 20 films—and fans idolized her for her china-doll complexion, raven tresses, and petite, stylish frame. Though her celluloid appearances were minimal—she did much more stage performing—she snagged two Academy Awards for her film acting. The British beauty received Oscars for her definitive roles as Southern belles—ladies of the South in very different directions. She played the feisty, never-say-die Scarlett O’Hara, as well as the faded, jittery, and reclusive Blanche DuBois. The incarnations couldn’t be more different than day and night. November 5 would have been Miss Leigh’s 100th birthday. The month of November is filled with tributes to her—movies playing on TCM, museum exhibitions, and biographers being interviewed in film magazines and general-interest publications. For doll collectors, though, Vivien has always been on their minds. 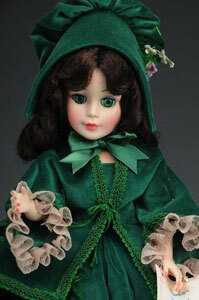 Her likeness or dolls resembling her allure have been a mainstay of many manufacturers’ collections. 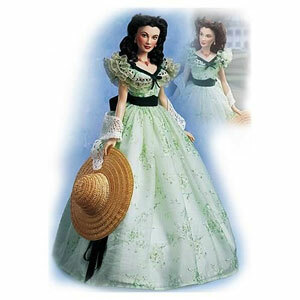 The determined, flamboyant, spoiled Scarlett O’Hara has been created as a fashion doll and a collectible by all of the industry’s big names. Some of the results have been very much in Leigh’s image; others are more about the costumes and the accessories. Still, when a collector unwraps a new Scarlett doll, it’s impossible not to envision Vivien or hear her well-scripted encounters with Clark Gable’s Rhett Butler. Watching “Gone with the Wind” recently—okay, I admit it, it was last night, stayed up until two in the morning with Robert Osborne as my host—I was scandalized (yet again) by Scarlett’s wanton disregard for propriety. She is a social-climbing, backstabbing, unapologetic flirt and wannabe home wrecker. (Poor Melanie!) Her taste in men is horrible—Ashley Wilkes!—and her relationship with Rhett is dysfunctional, to say the least. Most jarring, though, are the scenes where Scarlett interacts with her “help.” However, these aren’t domestic servants or put-upon maids. These are slaves. That concept is not drummed home or beat upon, as it would be if the movie had been made in 2013. Instead, the arrangements are alluded to, and the War Between the States is a backdrop that serves to strengthen Scarlett and make her grow up. The Civil War unfurls as Scarlett O’Hara’s finishing school—taking a spoiled, narcissistic, pampered young girl and forcing her to become a woman able to stand on her own two feet. “Gone with the Wind” is a sweeping epic. It is a part of the American cultural identity, showing that filmmaking could be grandiose while also zeroing in on how one character evolves from being naïve and sheltered to wise and forward-thinking. 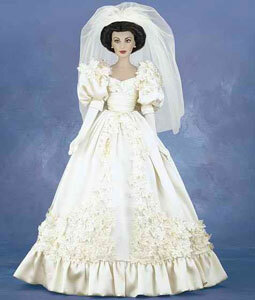 Why, then, do doll collectors continue to acquire Scarlett dolls? Are they fans of her transformation? Are they knocked out by the fashions that are saturated in Technicolor glory? Do they remember when they first saw the movie or read the book, and the dolls trigger that recollection? The MGM blockbuster debuted in 1939; in 2014, it will be its 75th anniversary. So hard to believe! Having been restored to its initial deep, rich, intense hues, the actual film stock looks fantastic. It is an experience to immerse one’s self in. However, the politics and the way the Southern women were catered to and pampered—scenes of young debutantes in their undergarments napping together on enormous beds, while black child slaves fan them with oversize palm fronds—is disturbing and peculiar to a modern sensibility. Still, everyone should see this movie to understand the dynamic of “opposites attract” that underscores all of the Scarlett-Rhett scenes. It’s a movie device that has been used ever since. 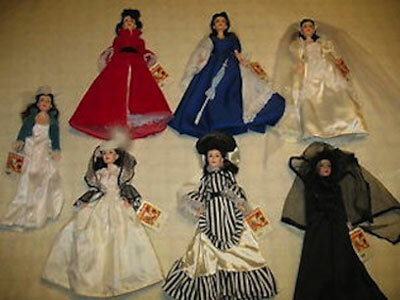 Maybe that’s why Scarlett dolls and Gone With The Wind dolls are so popular. They appear to be all about the fashions and the outward appearances. But maybe, deep inside, they remind the collectors that they can and should grow to be more than they were ever expected to be. To quote Vivien as Mrs. O’Hara Hamilton Kennedy Butler: “After all, tomorrow is another day.” Potential can be met and surpassed at any time. NextCould She Be The Most Beautiful Doll in the World? 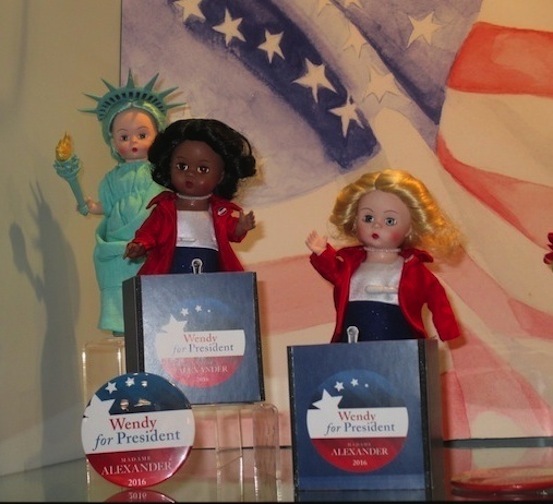 Toy Fair: Entering the presidential race, doll candidates have something to say about US, us! 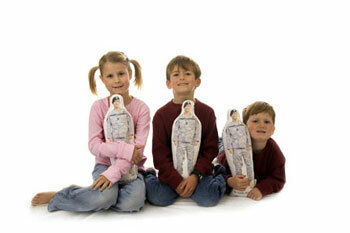 Homeland Security: Hug a doll and thank a soldier this weekend.